The fundamental rule of income-tax deductibility is, or at least is supposed to be, that expenses are deductible against income if and only if they are incurred in earning that income. Negative gearing violates that rule: a loss on your investment property is deductible against your salary although it isn't related to earning your salary. Meanwhile the cost of travel to work is not deductible although it is related! It's called class warfare: one rule for the property investor, another for the worker. If you're a property investor and a worker, you're at war with yourself. The negative-gearing rort not only costs the budget about $5 billion a year (The Age, 1 May 2013, p.5), but also fails to achieve its stated purpose of providing affordable rental housing, for two reasons. First, to claim negative gearing, you must make the property “available” for rent but needn't actually “find” a tenant; hence you can demand too much rent or be too picky about tenants. Second, to claim negative gearing, you don't need to add to the supply of housing; you can simply buy an existing home, forcing a prospective owner-occupant onto the rental market. 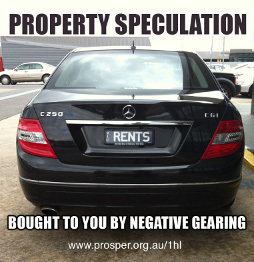 The obvious solution to the latter problem is to allow negative gearing only for new homes. Due to space limitations, that was as much as I could say in my letter (“Not fit for purpose”) in The Age today. (1) Allow negative gearing only if the property is tenanted; if it's vacant for (say) six weeks, disallow deductions for the whole six weeks. (2) To encourage building, exempt future purchases of new homes from rule (1) for (say) five years after construction. Rule (1) would make landlords more anxious to fill their vacancies and more reluctant to risk causing a vacancy by raising the rent. There would still be an inverse relationship between vacancy rates and rents, but the advantage to tenants from a given vacancy rate would be greater. Proposals like these would make negatively-geared investors earn their alleged incentive, ensuring that tenants actually get the alleged benefit. Which is precisely why neither major political party will talk about them.